US demand for single-use batteries is forecast to expand 1.5 percent per annum to $3.5 billion in 2020. Zinc air batteries will post the most rapid advances, buoyed by increased purchases of hearing aids by an aging population. Primary lithium batteries will post similar advances through 2020, boosted by their higher energy density relative to other single-use types. Healthcare applications will see the fastest gains in demand for single-use batteries of all major markets through 2020. 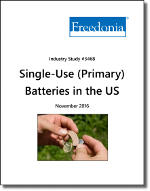 This study analyzes the US market for single-use batteries. Single-use batteries, which are also known as primary, disposable, or dry-cell batteries, are non-rechargeable energy storage units that are thrown away or recycled after discharge. Historical data for 2005, 2010, and 2015, plus forecasts for 2020 and 2025, are provided for sales, shipments, and foreign trade of single-use batteries, as well as for major product varieties. Companies mentioned include Duracell, Energizer, and Rayovac.